The PACE member called on the EU to support Ukrainians with "clearcut and consistent position". 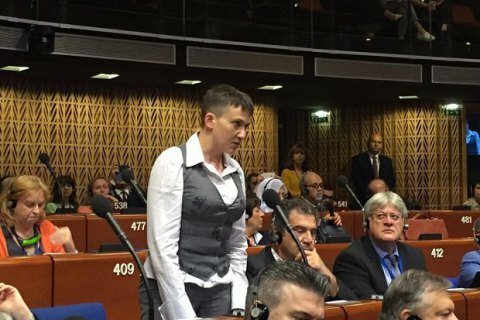 Verkhovna Rada deputy and PACE member Nadiya Savchenko opposed the resumption of voting rights of the Russian delegation to the Parliamentary Assembly of the Council of Europe (PACE). "We cannot allow the return of a delegation that has no respect to human rights, does not respect the immunity of a [PACE] delegate the way Russia was doing to me," Savchenko stated in her address on 20 June as quoted by Svitlana Zalishchuk on Facebook. Savchenko also noted that Russia has to answer in court for her abduction as well as for the abduction of other Ukrainians. "A country that has pledged security [to Ukraine] under the Budapest Memorandum, after the nuclear disarmament of Ukraine, dealt us a stab in the back. That was is a betrayal," she said. At the same time, Savchenko said she wanted reconciliation with Russia. The Ukrainian called on the Europeans to support the Ukrainians with a "clear and consistent position." On 10 April, 2014 PACE adopted a resolution, which has deprived the Russian delegation of the right to vote in the Assembly and excluded it from all governing bodies until the end of the year due to Russia's annexation of Crimea. In January 2015, PACE has extended these restrictions until April. In response, the Russian delegation left the PACE until the end of 2015. In January 2016, Russia refused to apply for confirmation of its PACE delegation's powers in PACE.